LUXOR AVJ42KBCDL-RB Metal A/V Cart with Pullout Keyboard Tray, Cabinet and 2 Drop Leaf Shelves, Adjustable Height, Blue by Luxor at Momiji Studios. MPN: AVJ42KBCDL-RB. Hurry! Limited time offer. Offer valid only while supplies last. The Luxor AVJ42 Series are excellent multipurpose AV / Utility Carts. 24''W X 18''D X 24''-42''H Adjustable height from 24'' to 42'' in 2'' increments. The Luxor AVJ42 Series are excellent multipurpose AV / Utility Carts. 24"W X 18"D X 24"-42"H Adjustable height from 24" to 42" in 2" increments. Shelves are 24"W x 18"D. Roll formed shelves with powder coat paint finish. Tables are robotically welded. Cables pass through holes. 1/4" retaining lip around each shelf. 3-outlet, 15' UL and CSA listed electrical assembly with cord plug snap. 4" ball bearing casters, two with locking brakes. Includes safety mat. 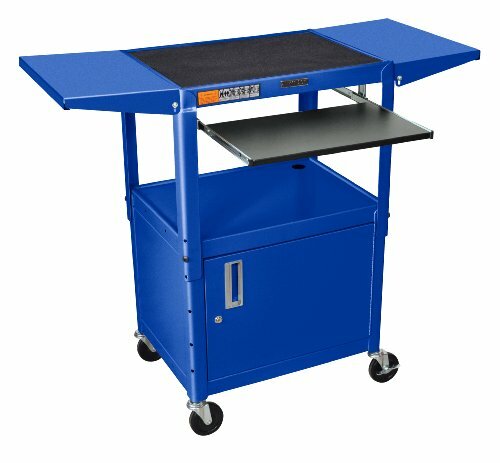 This AVJ42KBCDL is a Royal Blue adjustable height cart with Cabinet, Keyboard and 2 drop leaf shelves. Keyboard Tray Measures: 18 3/4" x 11 3/4". This Cabinet model has reinforced locking doors with full length piano hinges and is made from 20 gauge steel with inner dimensions 17 1/2'D x 24"W x 16 5/8"H. The drop leaf shelves measure 11"W x 18"D. Made in USA.